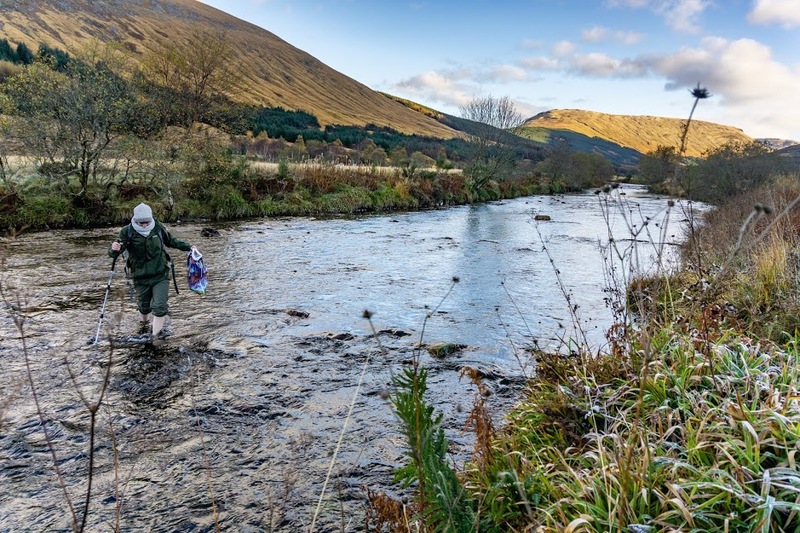 We started off at the car park in the early morning, knowing ahead what we needed to do first: cross the icy River Lochy. Because we knew ahead of time, we took sandals to change into so that we could keep our boots dry for the rest of the hike. This turned out to be a very good decision as the wind chill on the mountain was far below freezing so we wouldn’t have been very comfortable in wet boots. We left our sandals hidden by the river so that they were ready to use for the return crossing at the end of our hike. Smart cookies I know! Doing river crossings in sandals isn’t usually recommended but the water level was only just above our ankles so we deemed it safe. The water was rather chilly but our feet warmed up again quickly once back in our dry boots. Ben Lui is a great hike in that it gives you options to tie in other Munros in the area. One classic hike connects 4 of these peaks and is considered to be a descent hiking experience. I was hoping we would climb at least 2. But the wind, man, the wind apparently didn’t think it was a good idea. It was very strong, definitely about 60mph and on the way down well around 70mph. It was the kind of the wind that in places had Anna down on her hands and knees. So in the end we just stuck to Ben Lui. Hiking on the edge of the winter season is very tricky. There is not enough snow to justify crampons but some sections are already a little icy and snowy. I can see how this is easily underestimated or misjudged. If you see heaps of snow everywhere, you know what’s going on, but if you know that the first snow fell last night, it’s hard to judge what the surface is going to look like (especially from the safety of a car park). We were lucky and it turned out that we didn’t need crampons. But the weather was still harsh enough to feel like we were in the depths of winter. After the river crossing we followed a small trail through a forestry plantation beside another stream. It was incredibly boggy and we had to watch where we stepped to avoid submerging our boots and undoing our good work of keeping them dry. We crossed this stream doing some rock hopping with the help of a rope suspended between 2 trees and this was where our path ended. The traditional route veered off to the right to go up to the saddle between Ben Lui and the neighbouring peak of Beinn a’ Chleibh. However, this would have meant doubling back if we wanted to make a loop out of both peaks. So we decided to hike directly up to the peak of Ben Lui. 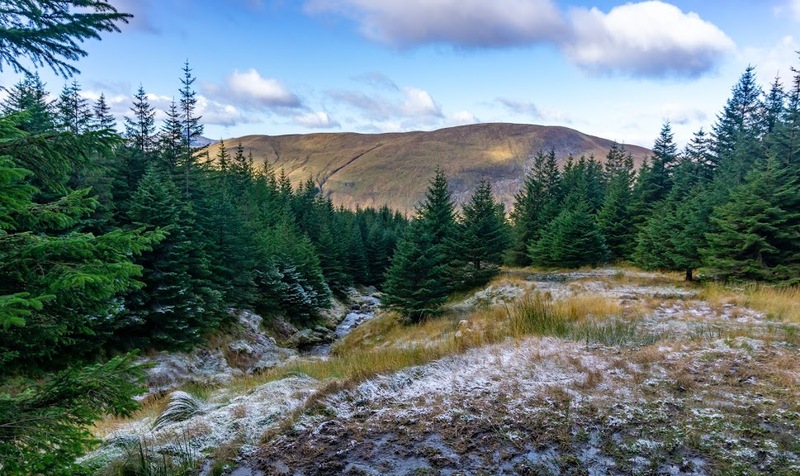 It was an arduous trek, as going off-trail tends to be in Scotland (bogs and tussocks make each foot step a bit of an effort). But, going straight up has the advantage of being very satisfying when you turn around to look at the view and see how much altitude you’ve gained in a short time. It also warms you up! Which was good because the wind chill was insane. We passed a small waterfall where the spray and formed thick icicles on the surrounding grass. Nearer the summit things got windier and a little more tricky. We left the boggy grass behind and had to climb over some pretty craggy rocks. It wasn’t too challenging, but the wind chill meant your hands froze if they were uncovered for a second (Anna stupidly didn’t bring gloves so we ended up sharing Michals, each of us with one gloved hand one bare). The gusts also made you feel pretty unstable. Luckily, we had had a similar experience with wind in Iceland so we knew what our threshold for safety was before we’d have to turn around. We decided that we hadn’t quite reached this threshold and that we wanted to push on to the peak, but it was a narrow margin! Oddly enough, maybe due to the shape of the mountain, the peak itself was actually relatively sheltered. And the views were stunning. But we didn’t hang around too long as we knew that the wind was forecast to get stronger and we still had to get safely down! The wind at the start of our descent down the saddle was the strongest it had been yet. We met another hiker coming in the other direction who warned us of its strength and cautioned us to be careful. We decided that there was little point in battling it when we wouldn’t want to spend any time on the summit anyway, so we headed straight back down to the car, via the river crossing of course! Overall, the hike was spectacular. It’s an amazing part of Scotland where the coastal lowlands meet the highlands. 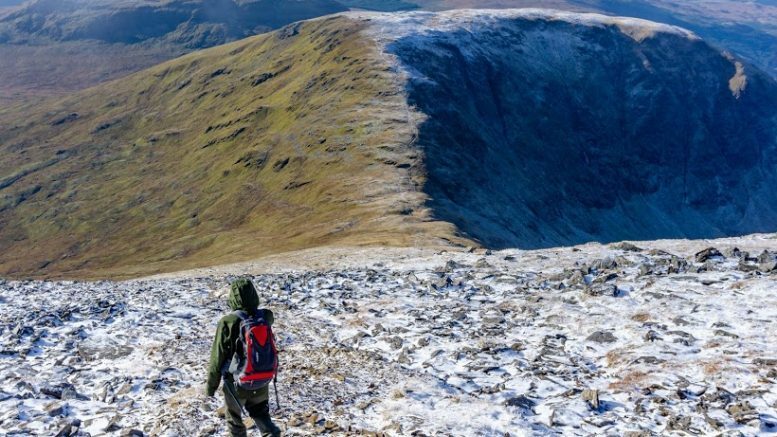 I’m hoping to come back in the spring to attempt to hike all 4 Munros in the area in a day. What a beautiful hike that’s going to be! When I talk about other hikes during hiking it always reminds of Vahchef, an Indian chef on Youtube, who often gets excited about other food while cooking something else, like fried tomatoes while baking eggplant. One could say that’s the lack of mindfulness and being present in the moment, but I could say that’s one way of appreciating the moment. 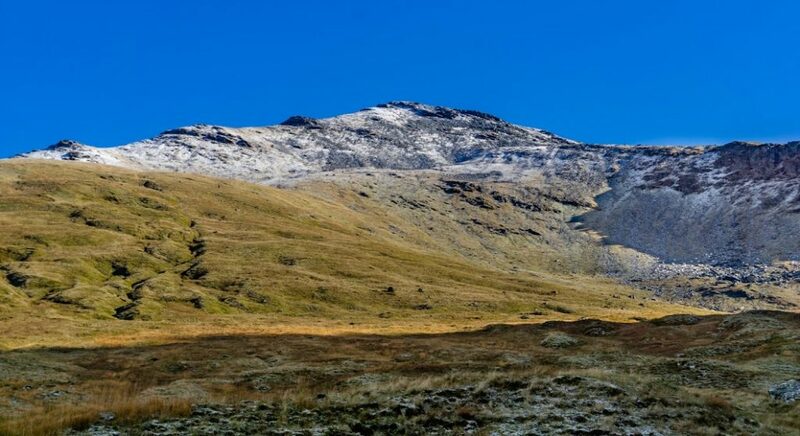 Be the first to comment on "Ben Lui and the First Snow of the Season"